A fat, greasy slice of Indian cultural history is buried in the YouTube archives of the 1990s TV series, Rendezvous With Simi Garewal. This prime-time talk show, a Koffee With Karan forerunner, threw up a lot of tacky guff. Unlike Koffee With Karan, it also featured some of the weirdest revelations, unfiltered by PR machinery, that Indian celebrities ever made before or since. In 2002, one of these interviewees was a very young Kareena Kapoor, whom Garewal asked which man, if any, she might like to date. “I don’t know if I should say this," the supernally confident Kapoor said. She said it anyway. It was Rahul Gandhi. “I don’t mind getting to know him," she said, pretend-nonchalantly. “I come from a film lineage, he comes from a political lineage..."
For a long time I thought I was the only gossip addict who remembered this clip (and its bizarre visual follow-up, a page 1 image in Bombay Times the following week with a photoshopped image of the two young heirs in a garden, hands outstretched, their fingers presumably entwined but coyly hidden by a patch of shrubbery). 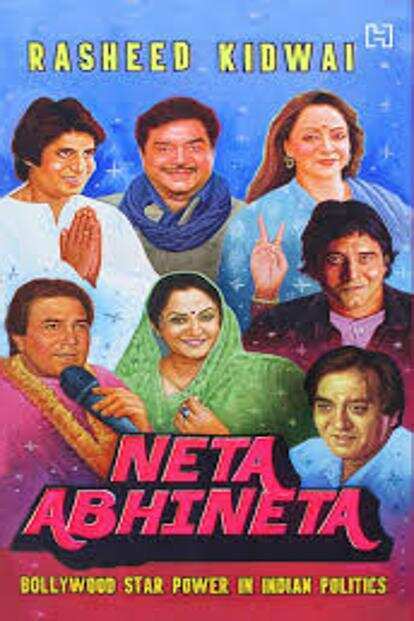 It was, consequently, a relief to discover it resurrected in all its glory in Rasheed Kidwai’s Neta Abhineta, an anecdotal history of Hindi movie stars who crossed over into national politics. Kidwai is a reporter with decades of experience covering politics in the Capital: you might say he knows how to cover egotistical, insecure, risk-laden businesses. Sonia, his biography of Sonia Gandhi, and 24 Akbar Road, his history of the Congress after Emergency, were both sincere attempts at demystifying subjects that seem opaque to many laypersons, even if their gossipy tone made them ultimately more obfuscatory than enlightening. They are also uniquely tough nuts for a journalist to crack. If Neta Abhineta seems like low-hanging fruit in comparison, it is. Show business in India is secretive and cultish, but for many decades it was more approachable and more in tune with its vast audiences than any other cultural industry. Film fans weren’t just its consumers, but also its constituents. Bollywood stars are often wary of commenting on social issues more heated than the weather these days. But to a scriptwriter or actor in the 1950s, the idea that their work was disengaged from politics would have seemed bizarre. The democratic spirit of the cinema manifested most clearly in the electoral politics of Tamil Nadu, where Dravidian politics were transformed by writer M. Karunanidhi and movie star M.G. Ramachandran. In 1982, a decade after MGR floated his breakaway AIADMK, N.T. Rama Rao, doyen of the Telugu movie industry, captured the political imagination of his own region by founding the Telugu Desam Party. Its legacy has outdone even his monumental acting career. Movie stars from Bombay (now Mumbai) did nothing for politics to anything like the same degree. Nor is it Kidwai’s case that they did. He does not state it explicitly, but an important factor in this was the Indian National Congress. A leader of the freedom movement, a peacemaker after the catastrophe of Partition, omnipresent in government and institution-building, the party of M.K. Gandhi didn’t just occupy the modern Indian imagination after 1947; it helped create that imagination. But as its revolutionaries became status quoists, so did their votaries in the movie business. At least three generations of stars happily associated themselves with the party. The maverick Dev Anand, who soured on Indira Gandhi and floated his own national party, was the exception. But even he had once wooed Nutan on-screen by offering her a panchsheel-wala pyaar in Tere Ghar Ke Saamne. They would have a love in the style of Jawaharlal Nehru and his Panchsheel policy of peaceful co-existence, one that would not only bring them together, but also their feuding fathers. The splintering of the old Janata Party and the energies unleashed by the Mandal movement allowed for new alliances between regional parties on the lookout for some quick borrowed glamour, and created a rift between stars and the Congress party. Perhaps the most personal connection between Delhi politics and Bombay cinema was that between Rajiv and Sonia Gandhi and Rajiv’s schoolboy friend Amitabh Bachchan, but neither the friendship, nor Bachchan’s parliamentary career, was to last. Amitabh Bachchan during a rally in 1989. Kidwai traces these dovetailing trajectories through to the present. But although he profiles Bharatiya Janata Party (BJP) politicians from Shatrughan Sinha to Paresh Rawal (current member of Parliament for Ahmedabad East), his book refrains from commenting on an ongoing political transformation in Bollywood. The Ram Janmabhoomi movement and the rise of an aggressive, inward-looking Hindutva are generally considered to be the realm of the conservative, bottom-line-oriented TV industry (which flourished in the decade after the demolition of the Babri Masjid in 1992) rather than Hindi cinema. Bollywood stars did join the BJP, but made no notable attempts to embrace its ideology on-screen. But this has altered with the ascension of Narendra Modi, a prime minister who may not demonstrate the easy enjoyment of popular cinema that his bête noire Nehru once did, but who understands and exploits the power of celebrity well. Of course, his supporters in Bollywood will have a hard time recreating some of the industry’s more outlandish feats of fealty to the Congress. As late as 1980, Feroz Khan would dedicate Qurbani to the memory of the authoritarian Sanjay Gandhi, with a title card that wished sweet sleep to the “prince" who had come and gone before his time. However, the industry is no longer shy of creating outright propaganda for the ruling NDA, whether directly linked to government initiatives (see the stars of the tailoring dramedy Sui Dhaaga, who were signed on as ambassadors of the Skill India initiative) or more generally aping the rah-rah style of its nationalist rhetoric (see Aditya Dhar’s forthcoming Uri, a celebratory retelling of 2017’s “surgical strikes" across the border). Bachchan, once elected to Parliament from Allahabad on a Congress ticket, has come to be seen as a Modi man, his ambassador for everything from Gujarat Tourism to the Swachh Bharat programme. The book covers a mighty swathe, from Dilip Kumar spending a night in Yerawada jail during the Quit India movement to Paresh Rawal’s fake news tweets. But it doesn’t really explain how the film industry got from one to the other. At best, we’re left with a sense of how artistic consciousness has perhaps retreated from the realm of the public to the private. Mehboob Khan, who made Mother India, once declared “Nehru, tu mera mehboob hai (you are my love)! "—to describe his political sensibility. When Kareena Kapoor said she “wouldn’t mind" a date with Rahul Gandhi, she meant nothing of the sort.